This weeks pic goes back to this past October, I had to travel to Las Vegas for work (so I did it on your dime, not mine). 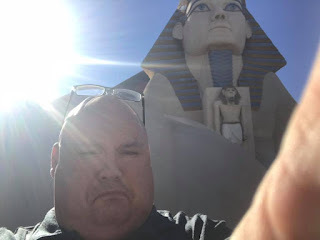 I had walked down the strip to get a few pictures, this one was me standing in front of the Luxor as I walked up and down the strip. Actually there is an overhead tram that runs between the Luxor and Mandalay Bay and I started out at Mandalay Bay on this day. The previous day I went around the northern end of the strip and Ceasars Palace. It was a fun trip, I would love to go back again someday. Something tells me that there is something I'm developing at work that may just have me back out there some day.